Sibs and I are showing our support for Movember. it's the least that we can do! 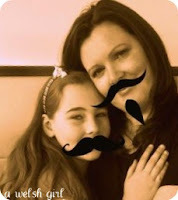 Movemeber is an initiative to raise awareness of mens health issues - specifically prostate cancer and depression. This is the third year that Neil has been involved and each year his moustache growing technique is improving. So this weekend he will be rising early to complete a 10k sponsored run that's up and down a mountain. 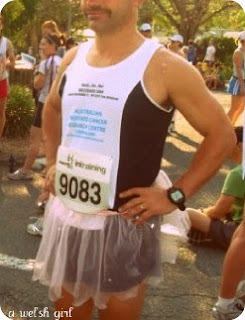 Here's a photo from a previous Movember run, and yes, that is a pink tutu! Sibs and I will be there at the finish line to cheer on the runners and to have a giggle at some of the costumes. We are going to make some fake moustaches to wear to join in with the fun. & i do love me some fake moustaches & pink tutu's!! The mo and the tutu look smashing on your hubs and the photo of you girls is gorgeous. Best of luck raising oodles of money. I particularly like the photoshopped beard on you Beth. Personally, I don't need any technical wizardry to make it look like i've got a beard. i just let it grow. Way to do Neil! It's a great cause. I love your photoshopping technique too!